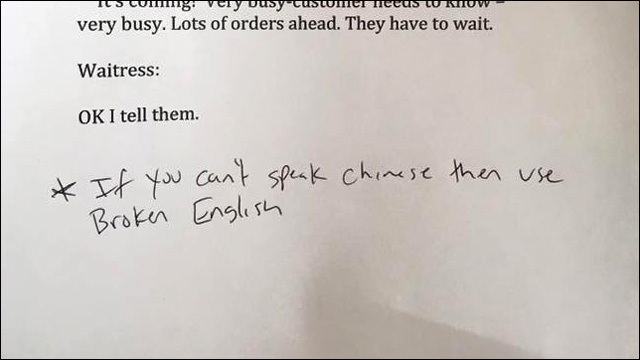 "If you can't speak Chinese then use broken English." So here's some everyday Hollywood wackness. This photo was taken at a commercial audition that was held on Wednesday. Actors were given no explanation of the scenario, or what the commercial was for, but as you can see, there's a lot of Asian-y nonsense. The scene: a busy Chinatown noodle house. Actors were instructed to translate the lines into Mandarin or Cantonese -- but if you couldn't speak Chinese, then saying the lines in broken English would suffice. 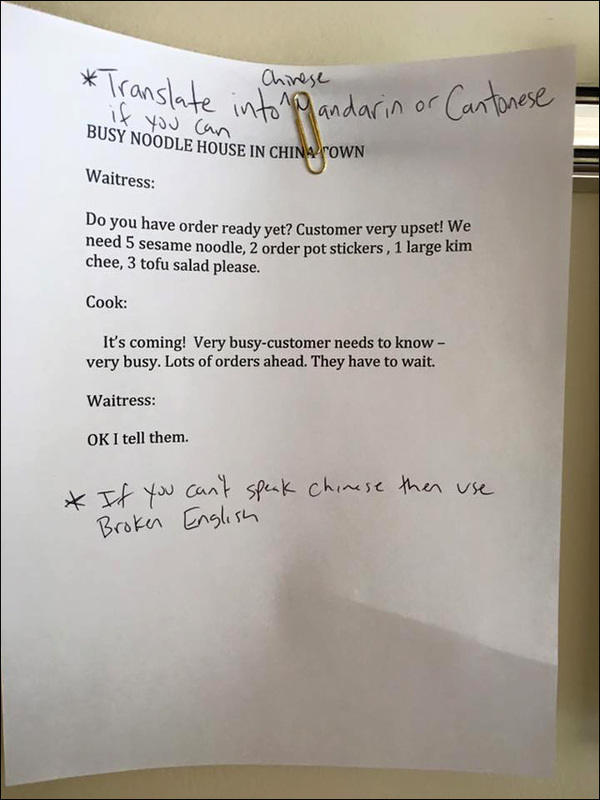 Why do I get the strong sense that this was not written by anyone who is familiar with the nuances of Chinese cuisine? Do you have order ready yet? Customer very upset! We need 5 sesame noodle, 2 order pot stickers, 1 large kim chee, 3 tofu salad pease. It's coming! Very busy - customer needs to know - very busy. Lots of orders ahead. They have to wait. Really? Kimchee at a Chinese noodle house? Maybe they're serving jjajangmyun. No, seriously, the sad part is, you know this broken English ching chong nonsense is probably pretty typical of what's available for Asian American actors. This one was particularly terrible enough that several actor acquaintances saw fit to snap a photo and post it on social media.